An early Country Music duo who strummed their tenor guitars and harmonized with the best of them. Radio programs dating back to the roots of Country and Western Music. The Delmore Brothers, Alton, born on Christmas day, 1908, and Rabon, Dec 3, 1916, were the sons of tenant farmers in Elkmont, Alabama. Music was an essential part of their poverty stricken childhood; their mother, Mollie Demore, was active singing and writing songs for her church. Mollie's boys took the sweet sounds of their mother's gospel music and blended it with the faster guitar work of folk music, which would influence the emerging genre of Country Music. At the age of 13, Alton published his first song in 1925, "Bound For The Shore", cowritten by his mother. Blending their vocal harmonies with six-string and the relatively rare "tenor guitar" (a four stringed instrument mostly used in Vaudeville), the brothers began recording in 1931. They had a contract with Victor Record's Bluebird label in 1933. The brothers became regulars on the ' Opry in 1933, when the show was still broadcast from the studio in the offices of the National Life & Accident Insurance Company in downtown Nashville. As the Opry grew in popularity over the next few years, the Delmores became the most popular act on the show. 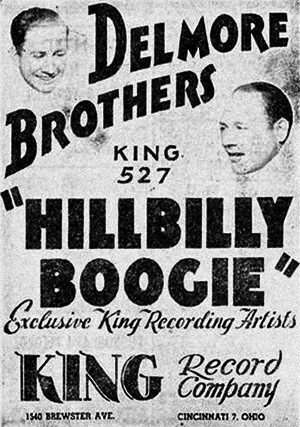 The Brothers left the Opry in 1939 after a disagreement with management. 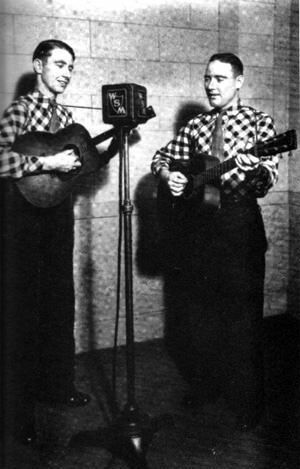 The Delmore Brothers continued write, play, and record, but they never returned to the high water mark of the Opry days. After the Second World War, the Delmore Brothers joined harmonica player and singer Wayne Raney, and the shows in our collection appear to be from that period. Produced for the syndication market, the shows were recorded on a disk. The recordings are also a lesson in the economics of the early music industry. Several times in each episode the Delmores and Raney make passionate pitches for the song book they are selling. Like Border Blaster Cowboy Slim Rinehart, the Delmores felt people would pay more for their songs than they would to hear them sung. Although fame and success surely mattered to the Delmore Brothers, there were certainly other things that were more important. Apparently they drifted away from the noise and confusion of the music industry. Rabon succumbed to lung cancer in 1952, and Alton lost interest in performing. Although he did keep tabs on the music industry. He raised a family in Alabama, making a living with music lessons and odd jobs. 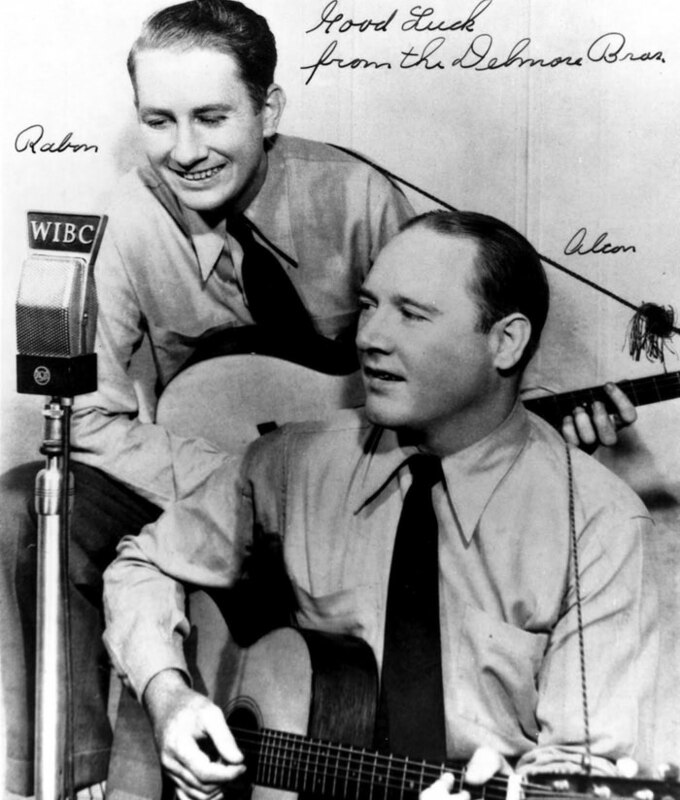 The Delmore Brothers were a large, if little known influence on Country Music, and helped to shape many artists. Bob Dylan says that when called to harmonize, he tries to embody what he learned by listening to the Delmores. Alton's youngest daughter recalls her father's first reaction to the Beatles in the 1960s. At first he was less than enthusiastic about the Mop Top's music, but then he learned that the Beatles were influenced by the Everly Brothers, much like the Everly Brothers were influenced by the Delmores; therefore, it stood to reason that the Beatles could not be all that bad! Please note: recordings in this collection are inferior sound quality. Be the first to comment on "Delmore Brothers"